After witnessing the murder of a scientist on the Citadel, Shepard and company begin to follow a trail of clues that imply an indoctrination process similar to what the Reapers have proven capable of. Except, the entity the crew of the Normandy and their allies in the science field are trying to seek out is not a Reaper. Rather, it is a being known as Leviathan, one rumored to have killed a Reaper at some point in the past. Knowing the power this Leviathan might possess, Shepard enlists EDI to help locate it, a process which takes them back to scene of the initial crime, to a derelict research station, and eventually to a watery world riddled with shipwrecks. Leviathan is straight-forward in its design. 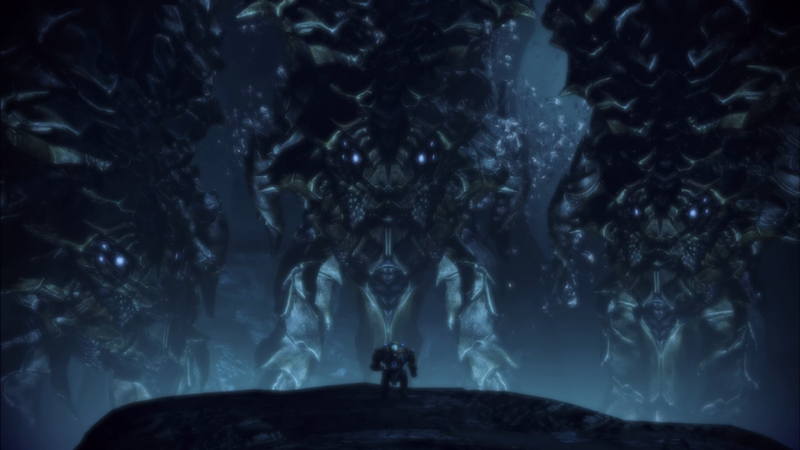 It cuts right to the chase, with Shepard’s search for Leviathan playing out in a similar manner as his/her visit to Eden Prime in the first game. There are artifacts that hold sway over those who have come into contact with them, and Leviathan is shown to be capable of channeling messages through these individuals. There is plenty of variety in the game design, from gathering clues around a small research lab, to unlocking a series of doors aboard the space station, and the typical combat against Reaper minions. All of it will be strikingly familiar to anyone who has played more than a few hours of Mass Effect 3, and it does feel like the Leviathan DLC’s pacing is a bit fast for the grand scale it intends to deliver its story on. The writing is handled well enough, and the eventual one-on-one encounter Shepard has with Leviathan is intense and very cool in its design. The ultimate payoff, however, does not echo as strongly as other events in the Mass Effect universe. Recruiting Javik in the From Ashes DLC obviously had a lasting impact on which teammates you had at your disposal and subsequently provided a unique perspective on the Reaper conflict. But the finale of the Leviathan DLC is a quick one-off scene that simply wraps itself up without the effects leaving meaningful ripples across the galaxy.